Here a man and a woman are about to kiss. I imagine that they call each other "darling" and maybe, just maybe they are about to go out to the theater. It is all velvet and skin and witty cocktails. Lovely. This reminds me of an old movie. 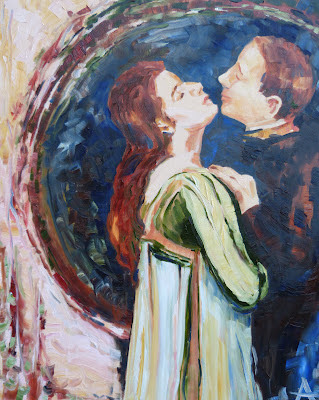 Yeah- I realized after I painted it that it is a bit like the Gone with the Wind movie poster... but I heard that Clark Gable had bad breath so let's not imagine those two in this scene. Common symptoms of periodontal disease include bleeding, soreness, smelly breath, and jaw soreness. In the early stages of gum disease, nevertheless, you may notice couple of, if any, signs or symptoms at all. The most common signs of gum disease are discoloration of the gums; your gums may appear a deep reddish or purple in color. An additional symptom is pain when your gum line is touched. If the primary symptoms of gum disease are left neglected, the dental infection can progress to periodontitis. When this occurs, people will probably experience: More critical dental discomfort, tenderness, as well as pain.